The Sandy's Wholesale Cosmetics website has been one of our most successful digital projects to date, generating massive amounts of business from the UK and internationally. 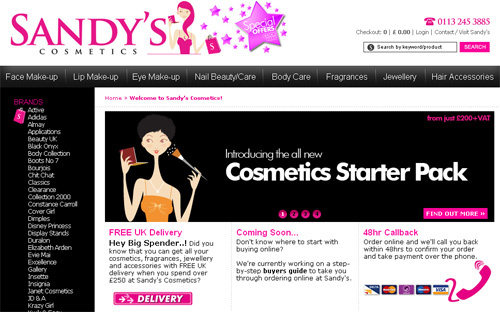 Part of the success of Sandy's Cosmetics has been the design of the site which has used a simple colour palette of bright pink, white and black to really make the site stand out and be remembered. We have run an ongoing search engine optimisation campaign to optimise for the highly competitive keyphrase 'wholesale cosmetics' and have consistently held the No 1 spot in Google.